Steve Murrell is a self-proclaimed "reluctant leader." That is even the name of his blog. Whether reluctant or not, Murrell leads one of the largest churches and church planting movements in the world. Victory Christian Fellowship in Manila, Philipines, has over 50,000 members and meets throughout the city in five campuses. Every Nation is the ministry that Murrell founded to plant churches and train leaders. They have churches in over 50 nations. The book takes the reader on the journey of how a few college students went on a month long mission trip to Manila in 1984 and saw 150 young people come to Christ. That group formed the nucleus of Victory Christian Fellowship. But how did that 150 turn into over 50,000 in less than 30 years? According to Murrell, the church was not built on flashy gimmicks or the latest church growth strategy. "Creativity and relevance are way overrated. Want a healthy church? Try consistency and repetition." Murrell and his team have taken one basic concept, that of discipleship, and used it to build a church and a movement that is having an impact throughout the world. Wikipedia is a resource that anyone can contribute to. In the same way, Murrell sees discipleship as something that every Christian should be participating in. WikiChurch explains that the reason Victory Christian Fellowship has grown like it has is because every member is expected to immediately start discipling someone else. Even if the person has only been a Christian a week, they are encouraged to start intentionally reaching out to their non-Christian friends. The new believer is, at the same time, being trained and discipled themselves. Empowering every Christian to minister has created an incredibly vibrant and mature church culture at Victory Christian Fellowship. There is no waiting or probationary period to endure before the new Christian is declared mature enough to start ministering. Murrell says, "We can't wait until every believer feels mature enough to minister because no one will mature unless they minister." There is no magical moment when someone is mature enough in their faith to start discipling others. Instead, maturity comes as new Christians start sharing their faith and taking others on a spiritual journey. Murrell says that this has led to an abundance of mature leaders, many of who eventually become pastors and leaders themselves. Murrell is quick to point out that a cookie-cutter approach with his book will not work. He ministers in a predominantly eastern culture. Things will work there that will not work in the West, and vice versa. 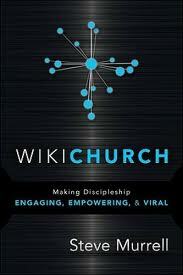 An American pastor is probably not going to be able to use WikiChurch as a magic formula to grow their church. What that American pastor can do, however, is evaluate their discipleship program and look for areas that need changing. In Matthew's Gospel, Jesus' last command to HIs disciples was, "Go and make disciples of all nations..." That command still holds true today. And the nations are waiting! My wife, Annie, and I are serving the Lord in Brazil. We are training leaders and helping plant churches. Would you consider becoming a part of our support team? Here is the link. Obrigado!